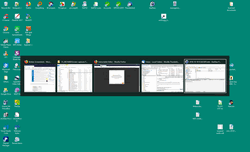 There are several programs running on the extended desktop (on the right hand side monitor). 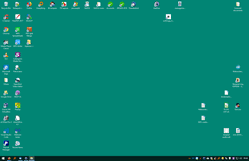 Without the second monitor all you see is this, and your programs are trapped out of sight. To see what’s hidden off-screen, hold down ALT and press TAB repeatedly. 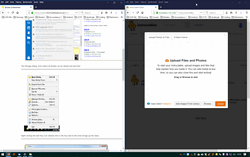 This cycles through thumbnail images of all windows even if they are off-screen or minimized. Release both keys when you highlight the window you want to rescue. When both keys are released, the window is selected but not visible. Hold the WINDOWS (flag) key down and press the LEFT arrow key a few times until the window is visible. Release both keys. When you release the keys, the recovered window will stay where it is, and other windows will be offered for rescue. 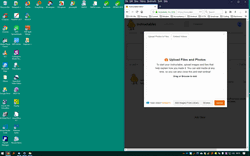 On the left are other available windows. Mouse click on the second window you want to rescue and it will be placed next to the first. Repeat the actions for other off-screen windows, and you’re done. 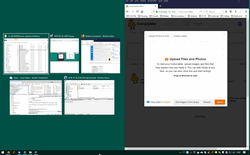 Note that you can use the WINDOWS key with the arrow keys (up, down, left, right) to park windows to any part of the screen. Sometimes the off-screen program may be waiting for a user response, so try pressing ESCAPE or ENTER to dismiss it. If all esle fails close the program using Task Manager, then reopen it normally. If it starts off-screen, it should now recover easily.